Jean-Léon Gérôme (1824–1904), Reception of Le Grand Condé by Louis XIV at Versailles in 1674 (1878), oil on canvas, 96.5 x 139.7 cm, Musée d'Orsay, Paris. Wikimedia Commons. For Gérôme, the Third Republic brought new challenges to which he had to rise. He had found favour with Napoleon III and his court, and had received Imperial commissions. His history paintings of Napoleon Bonaparte from the mid-1860s would hardly do well with the Emperor and Empress in exile in Britain, and the French nation shocked by defeat, and divided in its reactions. Jean-Léon Gérôme (1824–1904), A Collaboration – Corneille and Molière (1873), oil on panel, 48 x 67 cm, Private collection. The Athenaeum. 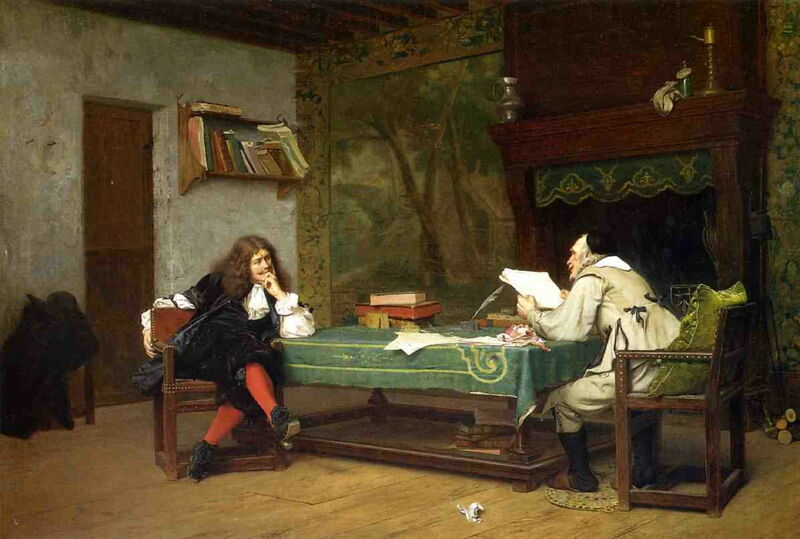 Perhaps feeling that the sixteenth century was safer ground, Gérôme captured two great French playwrights apparently working together in A Collaboration – Corneille and Molière of 1873. Jean-Baptiste Poquelin (1622-73), universally known by his stage name of Molière, was without doubt France’s greatest comic playwright of the era, and is shown here at the left. Pierre Corneille (1606-84), seen at the right, was the greatest tragic playwright of the era. What better combination could there have been for French theatre? This proved to be more than just a hypothetical question in 1919, when it was first seriously proposed that some, or many, of Molière’s plays had in fact been written, or ghost-written, by Corneille, a controversy which still smoulders on. The two playwrights did in fact meet, possibly in this way, when they collaborated with Philippe Quinault in the writing of Psyché in 1671. For Gérôme, this may have been a public expression of his desire to bury the hatchet, and for Republicans and their opponents to get on with rebuilding the nation together. This was exhibited at the Salon in 1874, from where it was sold to a New York collector for 30,000 francs. Jean-Léon Gérôme (1824–1904), L’Éminence Grise, Le Père Joseph (1873), oil on canvas, 68.5 x 101 cm, Museum of Fine Arts, Boston, MA. Wikimedia Commons. Accompanying this was this intricate painting of L’Éminence Grise, Le Père Joseph (1873), the shadowy figure who was the right-hand man of the notorious Cardinal Richelieu (1585-1642), who had been King Louis XIII’s First Minister of State from 1624. François Leclerc du Tremblay (1577-1638), known ever since as the Éminence Grise from his grey friar’s robes, had been a Capuchin friar when he first met Richelieu, and the two became very close. Père Joseph often acted as the Cardinal’s diplomatic representative, and even became war minister. 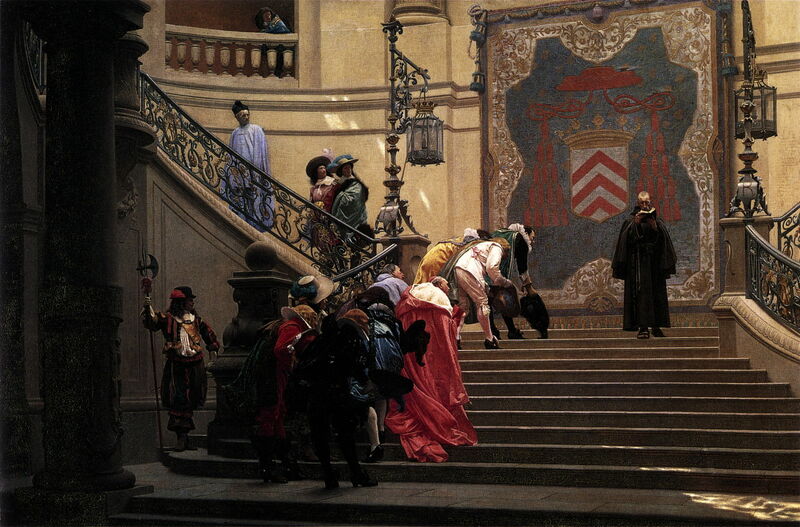 Gérôme was astute in this choice of subject, given the strong anti-clericalism of the Third Republic, and the distrust of ruling cliques, particularly those based in the Catholic church. But, as ever, there is more to this painting than its superficial story: Gérôme shows a dazzling display of finely-dressed nobles bowing deeply at the sombrely-dressed Père Joseph, whose head is buried deep in a book. This is again about signs and appearance. This painting was sold to a New York collector shortly after completion, and exhibited at the Salon the following year, and again at the Exposition Universelle in 1878. Jean-Léon Gérôme (1824–1904), Markos Botsaris (1874), oil on canvas, 70.2 x 54.6 cm, Private collection. The Athenaeum. The following year, Gérôme again refused to be drawn into painting recent history in France, opting for two historical portraits of fascinating relevance. Markos Botsaris (1874) had been a great Greek general in the early quarter of the nineteenth century, and lived between about 1788-1823. He had been the main military leader of the Greek War of Independence from 1821-23, and remains a revered figure in modern Greece. He died when shot in the head during the Battle of Missolonghi. 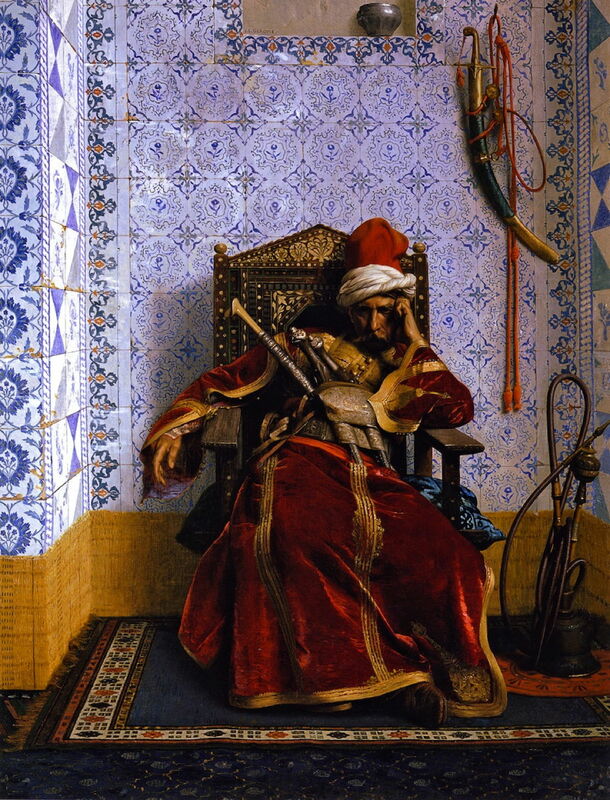 Gérôme’s portrait shows a brooding figure in Orientalist dress, slumped deep in his ornate chair, bristling with knives, swords, and weapons, longing for his country’s freedom from the Ottoman Empire. Jean-Léon Gérôme (1824–1904), Saint Jerome (1874), oil on canvas, 69 x 93 cm, Städelsches Kunstinstitut und Städtische Galerie, Frankfurt, Germany. Wikimedia Commons. 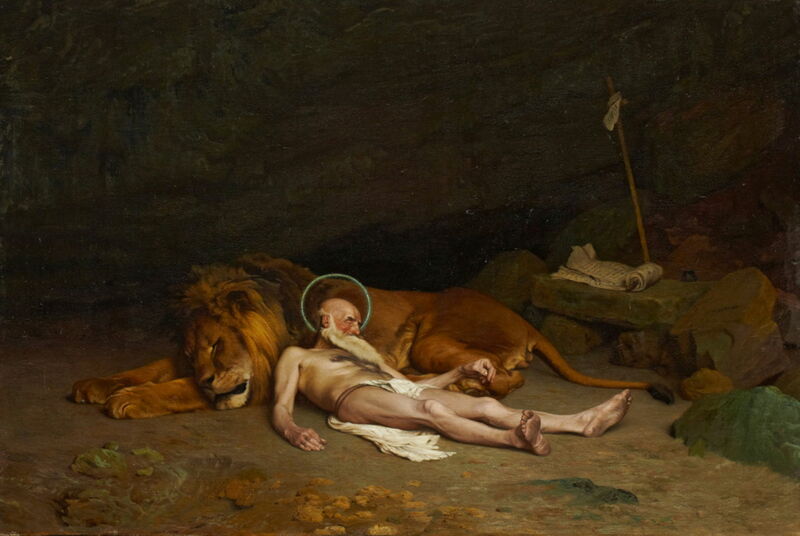 Saint Jerome (1874) stands in complete contrast: the ascetic saint is seen during one of his sojourns in the desert, almost naked, asleep on a lion, one of his better-known attributes. Over on a rock table is Jerome’s translation of the Bible, which he made between 392-405. For someone who so seldom painted religious works, this is an interesting excursion. This painting had apparently been lost for many years, until its recent rediscovery: it was exhibited at the Exposition Universelle in Paris in 1878, but seems to have vanished a few years later, and wasn’t rediscovered until 2011, when the Städel Museum in Frankfurt came across it in its store! Jean-Léon Gérôme (1824–1904), Circus Maximus (1876), oil on panel, 86.5 x 155 cm, Art Institute of Chicago, Chicago, IL. The Athenaeum. Gérôme had not forsaken the spectacle of the Roman arena. 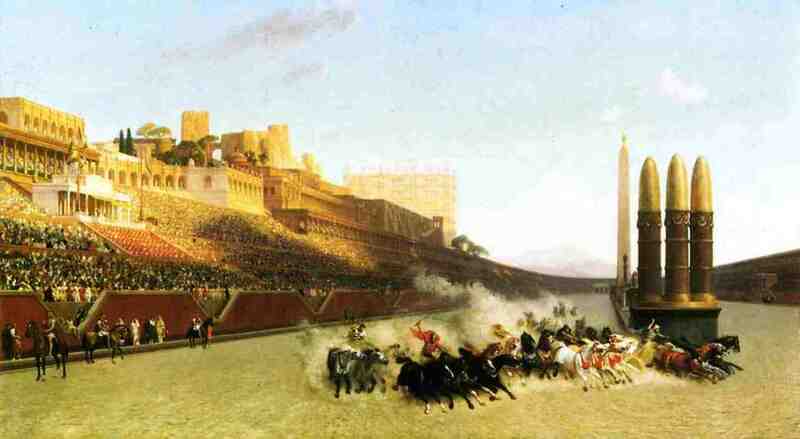 Circus Maximus (1876) is his recreation of four-horse chariot racing taking place in the largest of all the stadiums in the city, capable of holding a crowd of over 150,000. Now a public park, in its heyday its oval track was about a mile in length. But the great strengths of Gérôme’s previous paintings – their widescreen illusion, the shocking gore in the arena itself, and the spectators baying for blood – were lost in this painting, and I find it one of Gérôme’s few works which leaves me cold. In spite of this, Goupil had no difficulty selling this work almost immediately on completion, to a New York collector, for 125,000 francs. Jean-Léon Gérôme (1824–1904), Reception of Le Grand Condé by Louis XIV at Versailles in 1674 (1878), oil on canvas, 96.5 x 139.7 cm, Musée d’Orsay, Paris. Wikimedia Commons. 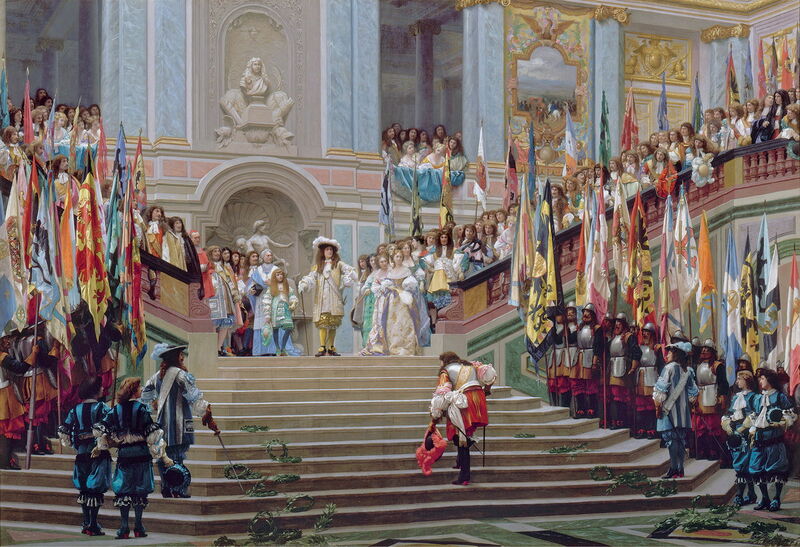 Gérôme returned to French history of two centuries before in one of his most elaborately-detailed and almost hyperreal works, Reception of Le Grand Condé by Louis XIV at Versailles in 1674 (1878). Louis de Bourbon (1621-1686) was a notable French general and noble, representative of the Condé branch of the royal House of Bourbon, who was a distinguished leader of the French army during the Thirty Years’ War. By 1650, the Grand Condé had fallen out of favour at court, and with the Regent Anne of Austria in particular, who had him arrested early that year for participation in the Fronde civil wars. He was pardoned in the Treaty of the Pyrenees in 1659, which formally ended the Franco-Spanish War, and accepted the authority of King Louis XIV. On returning from exile, the Grand Condé was received by the king at Versailles in 1674, following his military victory at the Battle of Seneffe against William of Orange. Here the Grand Condé is slowly ascending the steps between laurel wreaths of victory, and captured enemy standards at the edges, bowing with respect at the king before him. This may appear an odd subject for a painting eight years into the new republic, and more than a little revanchist in its reference to previous military victory over William of Orange. But I think it was a grand piece of escapism, which was very different from the remaining three paintings from this period. Jean-Léon Gérôme (1824–1904), Solomon’s Wall, Jerusalem (1869), oil on canvas, 92.1 x 73 cm, Private collection. Wikimedia Commons. 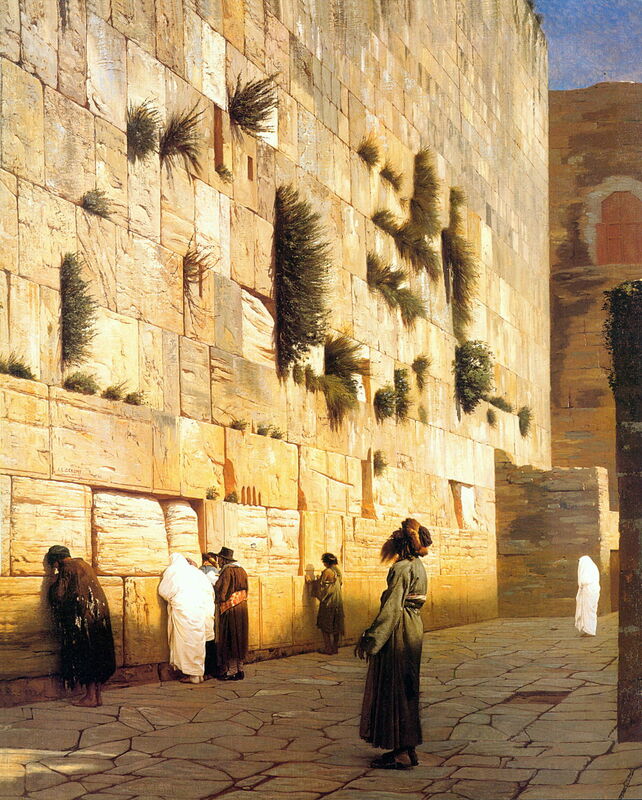 Solomon’s Wall, Jerusalem (1869) is the first of two paintings which are often considered to be stock Orientalist views. 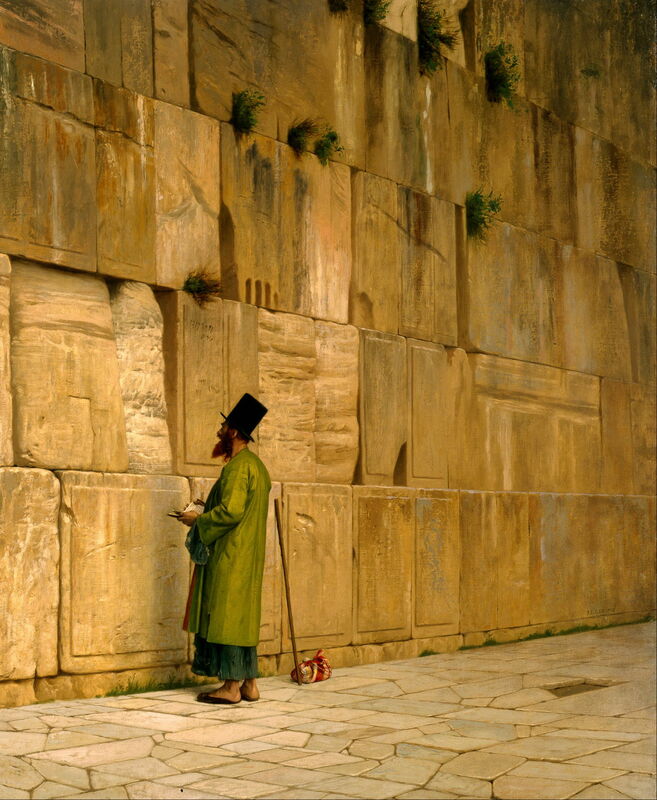 This wall purported to have been built around the city of Jerusalem by King Solomon between 1000-900 BCE is now most strongly associated with places in which Jews have traditionally gathered to lament the destruction of the Temples. This version, painted shortly before the outbreak of the Franco-Prussian War and the collapse of the Second Empire, shows a small scatter of people in different dress weeping at the foot of the wall’s massive limestone blocks. Jean-Léon Gérôme (1824–1904), The Wailing Wall (Solomon’s Wall) (1877), oil on canvas, 72.4 x 59.7 cm, Israel Museum, Jerusalem. Wikimedia Commons. Eight years later, post-war and well into the Third Republic, Gérôme painted The Wailing Wall (Solomon’s Wall) (1877), which I think the more moving for its simplicity of motif. Was France perhaps now at its own wailing wall? In the late 1870s, Gérôme concentrated on Orientalist views, and relatively narrative-free works derived from them. He hadn’t abandoned his Roman project, nor had he lost his interest in the metanarrative of paintings. And his first narrative work of the 1880s showed there was more to come. 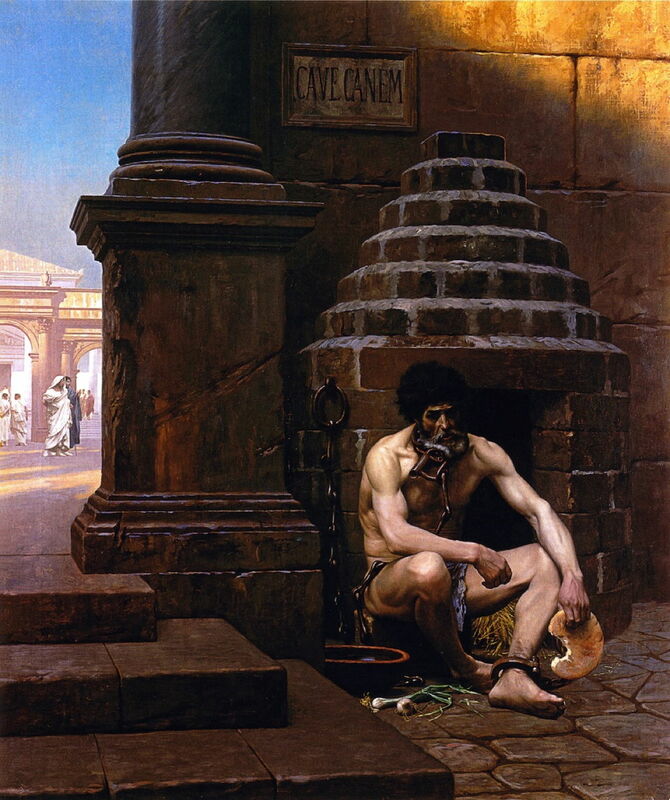 Jean-Léon Gérôme (1824–1904), Cave Canem (War Prisoner in Rome) (1881), oil on canvas, 108 x 90.8 cm, Musée Georges Garret, Vesoul, France. The Athenaeum. Cave Canem (meaning ‘beware of the dog’), sometimes called War Prisoner in Rome, from 1881, is little-known among his works today. Its conventional narrative is quite simple too: a prisoner of war in Rome, during reconstructed classical times (as shown in the glimpse at the left edge) sits chained up outside a stone dog kennel. He has a large water-bowl of the kind which might be placed by a dog, some onions or garlic, and a chunk of bread. Oddly, though, the prisoner appears well-muscled and in good health, not neglected or starving. Neither is this an image of spectacle destined for lucrative prints, but appears much more personal in its motivation. Gérôme gave this work to his home town of Vesoul, in eastern France. Is this prisoner not France, in chains following the war, treated like a dog, with the traditional but ominous warning above? Or could he be the artist himself, perhaps? Posted in General, Life, Painting and tagged Gérôme, narrative, painting, realism, revanchism. Bookmark the permalink. Yes of course: link to the page which appears when you click Macs, above, which is this one, or for a news feed, see this article, which explains it in detail. What happens when you open a quarantined app?